It’s been a chilly week, but the dogs at Orphans of the Storm® were still plenty eager to come outside and play in the snow! 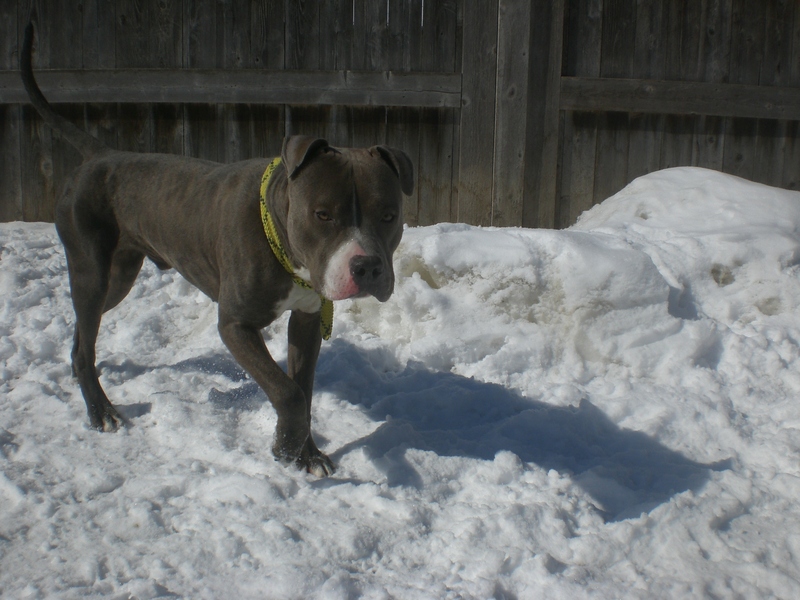 Azul the three-year-old Staffordshire Bull Terrier mix is an extremely handsome, well-behaved boy. He might look like a lot to handle at first glance, if you’re judging on size alone, but he knows his manners and is actually a very good walking companion. He seems like a pretty mellow guy who is more interested in spending time with his people than anything else. 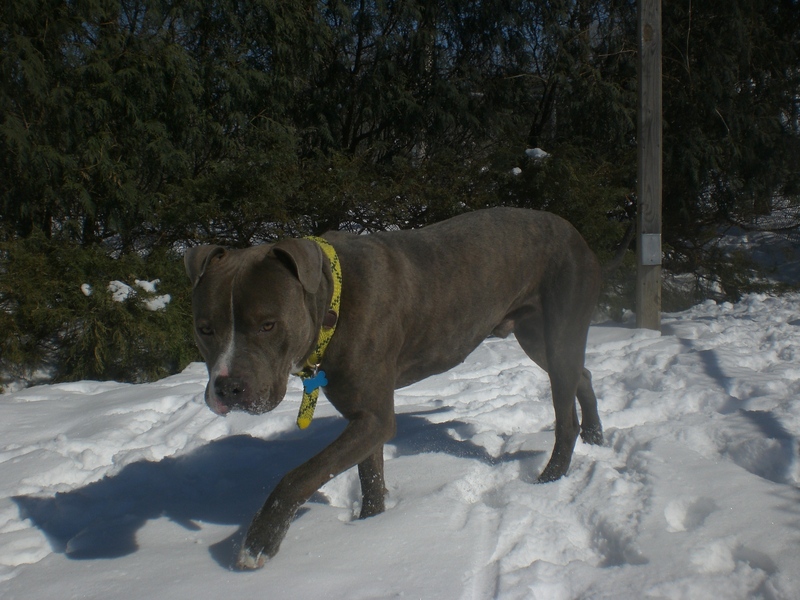 Azul may be a pooch who needs booties to protect his paws in the winter, because he wasn’t too keen on staying in the snow in the off-leash run for long. So instead, we took a nice walk around the snow-free parking lot pavement. Azul has beautiful coloring and warm eyes that are clearly saying, “Pick me!” Stop by the shelter soon to see if Azul is the one for you! Chola the two-year-old Hound mix is quite the cutie. I may be biased in favor of Hounds, but it’s because they have such sweet faces! Chola is no exception. She happily led the way on our walk and had a great time exploring the off-leash run, though she made sure to come back to me every once in a while to check in and get a nice scratch on the ears. She even put her front paws in my lap for a bit so we could snuggle some more. 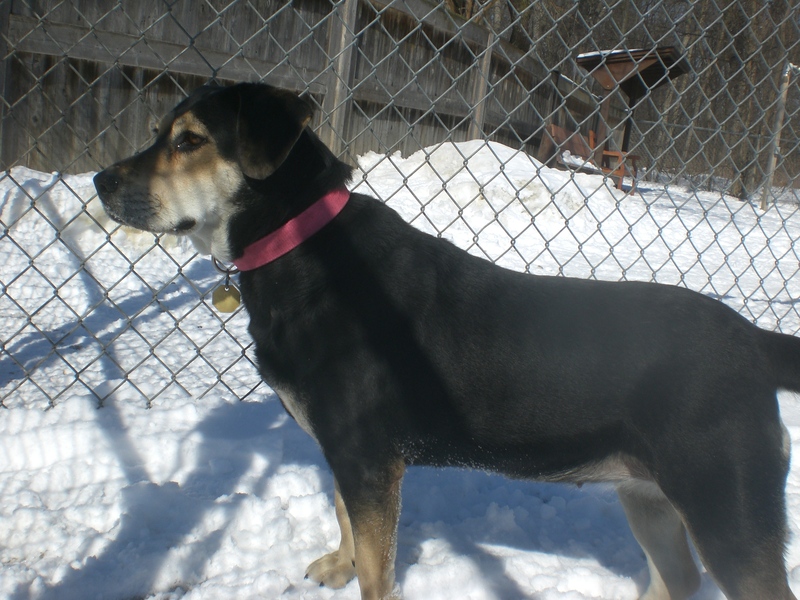 Chola is currently sharing her kennel with another dog who is about the same size as she is, but she would probably prefer to be the only pet in her new home. She had a fun time racing the dog on the other side of the fence when we were in the off-leash run, but it would be a good idea to take it slow when introducing her to other dogs in your neighborhood (which is true for all dogs, really). 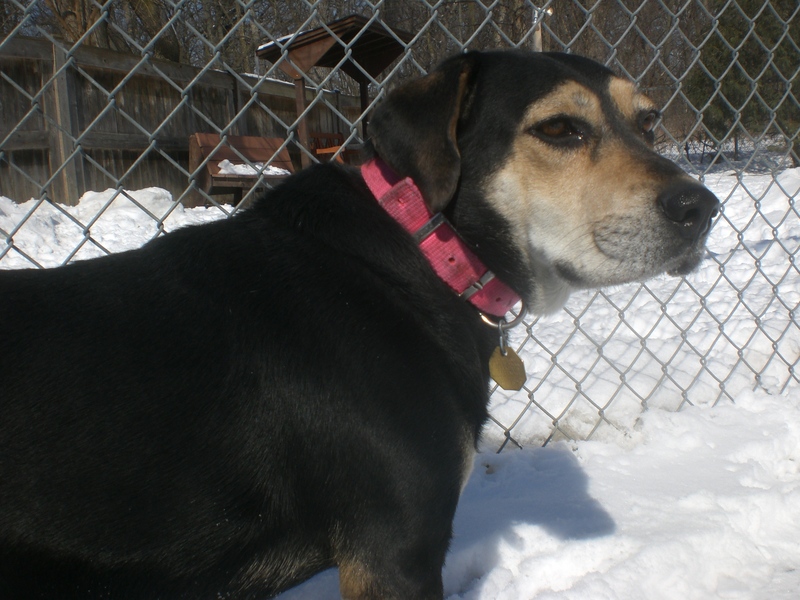 If you’re a one-pooch type of person, come in soon to meet Chola! 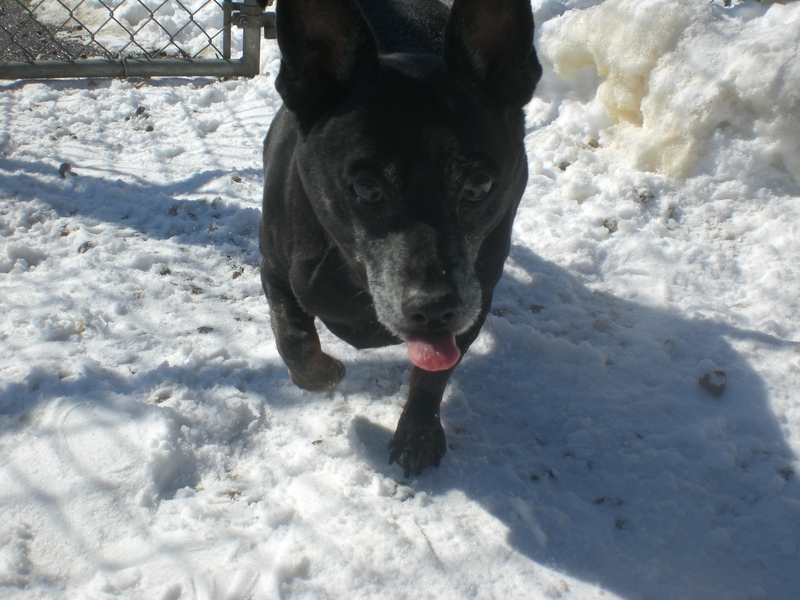 Skippy the eleven-year-old Miniature Pinscher mix is such a little sweetie. He hasn’t been at the shelter for very long, but he’s quickly become a volunteer favorite. Even though he’s probably sad and confused right now, since he lost his home, he’s still in high spirits and ready for his second lease on a happy, loving life. Considering the fact he’s a smaller breed, eleven really isn’t that old, and his actions prove that. 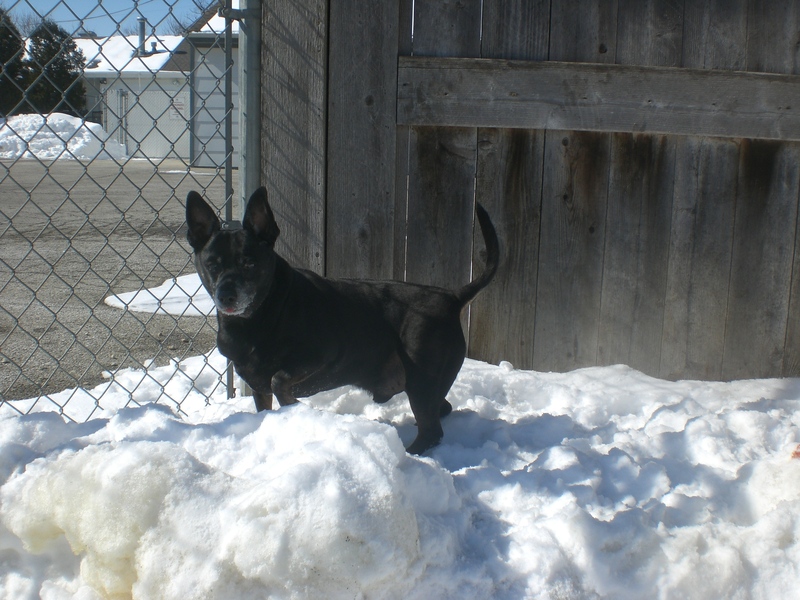 Skippy may have little legs, but that doesn’t stop him from jumping right into snow piles that are as tall as he is. Skippy also seems pretty calm when it comes to being around other dogs. Bella (whose head is about the same size as Skippy’s entire body) was barking at him on the other side of the fence, but Skippy just sniffed her and went on his merry way. If you’re looking for a smaller companion to brighten your day, stop by soon and say hello to Skippy! I also saw Cinder, Ebbie, Skipper, Tom-Tom, Trixie, Winter, and Zha Zha. Posted by Meet the Pooches on March 6, 2015 in Dog Profiles and tagged adopt, animal shelter, animals, Chicago, dogs, Hound, Miniature Pinscher, Orphans of the Storm, pets, Staffordshire Bull Terrier.